As previously mentioned, the voices have worsened again for Mr Man recently, telling him to cut himself. So far he has managed to resist carrying out their demands, but it’s funny how the fear that he will follow through never completely leaves me. Most of the knives in our house aren’t very sharp but I do own a craft knife from years ago when I went through a phase of card making, and I keep this well hidden. I needed to use the knife recently and I had to wrack my brain to try to remember where I had hidden it. Mr Man walked in on me as I retrieved it, and it made me jump like a naughty school girl trying to hide a secret. It was still stained with Mr Man’s dried blood from 2002. It was the only time he had ever cut himself at home, and yet I still fear it could happen again. During those hours I followed him everywhere. I tried not to make it obvious, but whenever he needed the toilet I would find something that I needed to do upstairs. I told the staff I was doing this, in an attempt to get them to understand how worried I was about Mr Man's safety. They told me I was being over protective and that I needed to allow Mr Man to take responsibility for himself. They said I was "hindering his recovery". So on Tuesday 1st October when Mr Man was at home for a couple of hours, I followed their advice and allowed him to go to the toilet alone. I knew it was wrong. It felt wrong. There was something in his face that told me it was wrong. I patiently waited down stairs. When I heard the floorboards creaking I knew he wasn’t sitting on the toilet, so I went upstairs. And that’s when I found him. 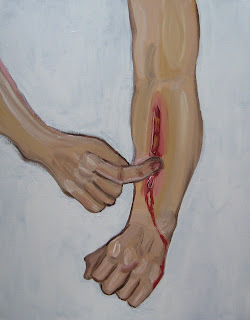 He had cut the inside of his forearm lengthways with the craft knife, and was prodding around inside with his fingers. “What are you doing?” I shrieked, as I took the knife out of his hand. He was clearly very distressed. “Please don’t be upset with me, I had to do it. They told me I had to get the aerial out”. It was difficult for me to be a calming influence when inwardly I was panicking. I know now from reading medical blogs that I probably didn’t need to panic quite so much as there was no arterial spurt, but at the time the cuts looked deep, and finding him in such a state was traumatic. I didn’t know what else to do except take him back to the ward. He really didn’t want to go, but I managed to persuade him by explaining that I didn’t know how to dress his wounds and that the nurses would know what to do. I wrapped his arm in a clean tea towel and we made our way back to the ward. The cuts were worse than last time, but he wasn’t monitored under any level of observation this time. The next two weeks were probably the worst two weeks for both of us, as Mr Man’s symptoms continued to deteriorate, and the staff continued to ignore it, but I will write about that another time. So when Mr Man says that the voices are telling him to cut himself, I know that the danger is real, although I also know that Mr Man is learning to cope better and resist their demands. I don’t follow him around like I used to, but I still make sure that temptation is hidden out of his way. I don’t hide every knife in the house, and if he really wanted to he could find a way to cut himself, such as with razor blades as he has before. But when just a momentary lapse in his resolve could result in such traumatic circumstances I don’t see the point in unnecessarily leaving very sharp knives in view. I don’t think that is being over protective, do you? *These points have been discussed previously in the post "Patient rights verses patient safety"
Nah, it's not. My family used to hide knives and razors for me. I self harm, but for periods in time when I was psychotic, I had voices in my head telling me to cut myself and kill myself too. Didn't tell anyone, though. I wish I had. i don't think that you're being over protective. I also think that it was horrid to tell you that you were hindering MM's recovery. Cheeky buggers. Would they behave differently if it were their loved one? I think not. Seaneen, I think many people keep things like that to themselves because they are afraid that if they tell someone it will mean a hospital admission. I think it's best for a sufferer to be open about symptoms though, to make sure they get the support they need. (Well, it would at least increase their chances of getting support - we all know services are crap!) I hope you feel able to confide in someone if you experience those symptoms again. Margery, I wondered if I was going insane some times - my heart was telling me one thing and nearly every professional was telling me the opposite - but it turns out I was right all along. But being right at that cost is no victory. Of course, no one said "I'm sorry, you were right and we were wrong". Hannah, I think after a while you develop a sixth sense, and seem to know instinctively when it's not a good time to leave the person on their own. This has happened so many times, and I can't even explain what it is - sometimes it's just a look. It happened that night and I ignored it, but I have never ignored it since on the advice of others, and this has caused many an argument! Thank you Seaneen, Margery, and Hannah for your comments. Hi I keep meaning to read your blog & today have finally got around to it.My Hubby is Schizophrenic too, though able to work full time for the most part is pretty stable.When he is unwell he tends to suffer psychotic depression & gets very paranoid about people laughing at him or are 'out to get him'.He has only ever self harmed once with a razor blade & that was in the very early days of his illness in hospital. I too suffer depression with a bit of OCD thrown in for good measure.Will place a link on my blog. Thanks for your very insightful blog. Hi Seratonin (Sis? Is that short for something?) Welcome to my blog. I know what you mean about finally getting round to things! Ooh, I shall have to pop over and check out your blog. My sister has suffered from OCD for years, and I lean towards that way sometimes with my depression. I have loads of questions about your hubby etc. but I suppose if I just read your blog I'll find my answers! Thanks for dropping in, I shall link to you too. 'Sis' is easier than writing out the whole of my name. Any questions I'll try to answer. Thank you Sis. I was just curious to know how long you have been married, if you knew of your husbands diagnosis before hand, that sort of thing. I read on your blog that you suffered from depression before your husband was diagnosed with Schizophrenia, but that your depression is viewed as being caused by your situation. Our experiences are very similar in that way. But we wives are not allowed to have any underlying mental health problems of our own - we just read too many books! Hi Coco, welcome to my blog. I'm sorry that you are having such a traumatic time at the moment. I know too well how exhausting it can be to try to keep someone safe. If your partner is taking Seroxat then he already recognises that he has depression and needs help. Like all medications though, Seroxat can have various side effects. I don't know how long your partner has been taking it for, or how long he has been feeling suicidal for, but Seroxat can cause suicidal feelings in some people, and also feelings of anger. It might be an idea for him to go to the doctors and discuss how he has been feeling, and possibly have his medication changed. He might find that easier to talk about if you are there with him for support. You mention that he also feels he saw an angel, this is also something that should be mentioned to the doctor. There are various causes of hallucinations and the doctor may want to refer your partner to a psychiatrist or community mental health team to assess the cause in his case. If you feel that the strain is becoming too much for you and that he is a real danger to himself and needs to be hospitalised, then you can arrange for an assessment - with or without his consent. I'm not sure where you are from, but in the UK you should be able to call A&E and ask to speak to the on call psychiatrist and then request an assessment. If your partner is willing, this could take place at the hospital, or the psychiatrist could make a home visit. If you become very worried that your partner is in immediate danger of seriously harming himself then you should call an ambulance or the police. Coco, I hope my response has been helpful to you. I'm sorry if I have told you things that you already know. I wish you and your partner all the best.